They were commanded by Brigadier General Edward Mathew (Coldstream Guards). The detachment consisted of 15 privates from each of the 64 companies of Foot Guards. Officers, NCOs, and musicians were also drawn from the regiments. A chaplain, surgeon, and surgeon's mates were recruited. They went ashore on on Long Island, camping at New Utrecht. Shortly after their arrival the uniform was altered from the parade ground look of a London garrison regiment to the more practical appearance of a combat unit. The cocked hats of the infantrymen were let down and cut smaller, and turned up on one side only. Breeches, stockings and gaiters were replaced by white trousers and half-gaiters (spatterdashes). General Howe ordered the unit to the field as a Brigade composed of 2 battalions of 5 companies each. Grenadier Company in the Coldstream Guards. 4 in First Guards, 2 each in Coldstream and Third Guards. The Guards participated almost immediately after landing in the Battle of Long Island. They landed on Manhattan at at Kip's Bay, and camped at Hell Gate (northernmost Manhattan). They encamped near Turtle Bay. that burned one-third of the city of New York. Captain Madan was left sick in New York from October 1776 until May 1777.
to duty with the Grenadiers, due to the sickness of captain Madan. 12 October 1776 and Pell's Point on 18 October 1776.
although they were not engaged in combat. The army marched west to Tarrytown NY and then south towards Manhattan again. carrying canteens, blankets and haversacks with one day's provisions. A local loyalist served as guide. They marched for Fort Washington on a prominent height at the northern end of Manhattan. The main assault was launched from the north by German troops under General Knyphausen. General Percy, with a column from New York City, formed line of battle from the south. The 42nd Regiment of Foot crossed Harlem Creek to storm the fort from the southeast. in a waterborne assault down Harlem Creek from Kingsbridge to attack the fort from the northeast. suffered heavy losses in the fighting, there appear to have been no casualties among the Guards. 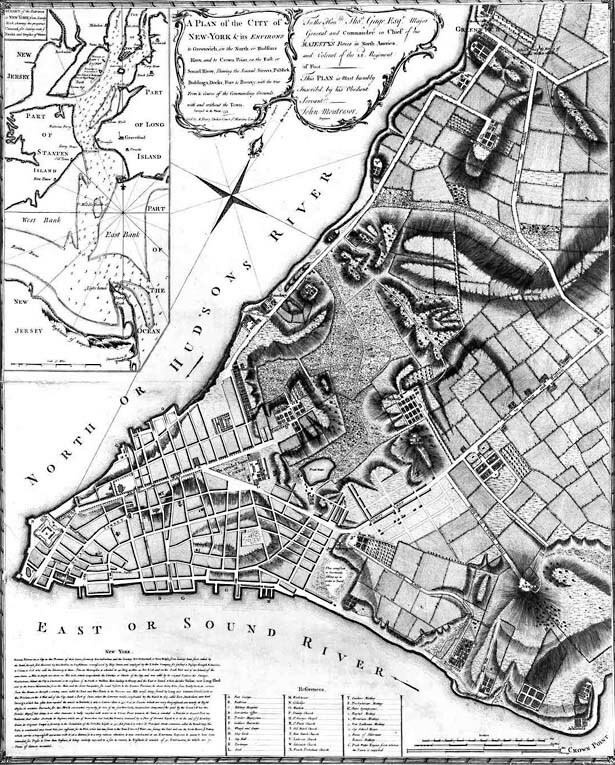 From Fort Washington the Brigade, with other elements of the Crown Forces under Cornwallis, crossed the Hudson River to New Jersey, participating in the capture of Fort Lee and Fort Constitution. and the Guards were quartered at Raritan Landing, just up river from Brunswick NJ. After the Continental victory at Trenton, the First Battalion of Guards was ordered to the field for several days in early January 1777, while the Second Battalion stayed with Brigadier General Mathew to assist in the defense of Brunswick. During the remainder of the winter the Guards participated in several raids, feints, and foraging parties. The Brigade was in combat at Short Hills NJ. The Brigade embarked from New York with the forces destined for Philadelphia via the Chesapeake River. The Guards saw action at Brandywine, Valley Forge, Germantown, and White Marsh before going to winter quarters in Philadelphia. met the Continentals in battle at Monmouth Courthouse NJ. Due to a lack of officers, the Guards spent most of the next two years in garrison in and around New York City. The flank companies of the Brigade were sent to the field for raids and skirmishes including Portsmouth VA and New Haven CT in 1779, and Young's House NY in 1780. The entire Brigade saw action at Springfield NJ in 1780. Brigadier General John Howard (First Guards) was temporarily appointed to replace Brigadier General Mathew in 1780 until the arrival of the new commander, Brigadier General Charles O'Hara (Coldstream Guards). when O'Hara had joined the detachment. With great gallantry, the Guards forced the crossing of the Catawba River NC. after which the Brigade was temporarily reduced to one battalion of 4 under-strength companies. The Guards marched with Cornwallis to Yorktown VA and surrendered to the Continental Army. General O'Hara was second in command, and surrendered Cornwallis' sword to Washington's representative, General Lincoln. Most of the Brigade's officers were paroled and the men marched into captivity at York PA, where they remained until 1783. During their imprisonment, Lieutenant-Colonel John Watson (Third Guards) commanded the Brigade from New York. The Guards returned to England in two detachments, one arriving in January and one in July of 1783. After disembarking, the men marched to London to rejoin their regiments.